This is a short book at only 109 pages, but it's full of thoughts and ideas about giving. Most of us who have been in church for any amount of time have heard things like "To NOT tithe is to rob God." 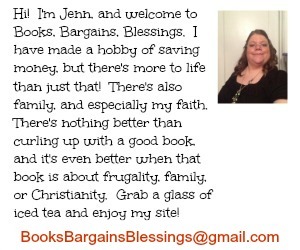 or on the opposite side "The tithe is an Old Testament mandate and we live under grace." 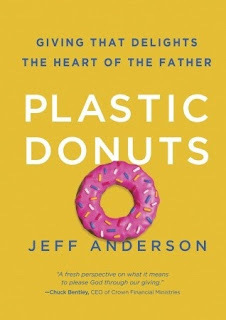 Author Jeff Anderson doesn't take either of these approaches, but rather the approach of Christians should give God their plastic donuts. What does that mean? His daughter gave him a toy piece of food from her kitchen set one day and he saw the delight she had in giving him what she was able to give freely and willingly. He came to the conclusion that is how our giving should be to God. This would be an excellent book for a small group discussion or to make into a sermon series at your church. I'm not sure the average person would pick this up on their own because, honestly, money is a topic that is shied away from in many churches. What pastor likes to get up and teach on giving? It's a hot topic and certainly one that can ruffle feathers of the flock. But the way Anderson approaches it, it's a Biblical concept that doesn't dictate what you should do except to give joyfully. THAT is something I think all Christians can agree is a great idea. 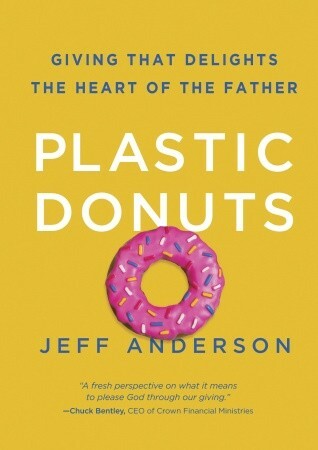 I think it's great this book is out there as a resource for both individuals and churches, and I hope that the ideas within Plastic Donuts become the attitude of giving we see in western Christianity.